Modular Construction: permits the arrangement of various sizes and shaped in heating arrays. Fast Response: to full output within two seconds. Power Density: up to 200 watts/sqin. Self Cleaning Reflector: lightweight high temperature ceramic. Provision for mounting Heat Lamps: tungsten element quartz lamps 1.0" OC. Air Cooling: of reflector, electrical terminals, lamps' envelopes and end seals. 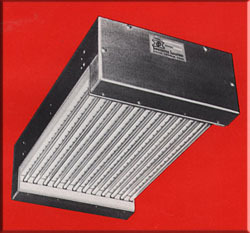 Units designed for heating lamps to be located vertically. Blowers and Air Flow Systems. Complete Temperature and Power Control Systems. Special Heaters designed to customer's specifications. Drying or Curing coatings (paints, inks or adhesives). Soldering, Brazing and Fusing of metals.